This week’s report commenced on Blue Monday, the third Monday of January having been awarded the gloomy title due to a combination of post-Christmas blues, cold dark nights and the arrival of unpaid credit card bills. This (holiday-company inspired day) may well be the reason for a lack of Club racing this week or it could be that we really are all waiting on our long-awaited February pay-packet; there aren’t actually many races on; it’s too cold or; we are simply too engrossed in our new Half and Marathon training plans! Yes, we have recently been bestowed with various appreciated and creative January indulgences from our Club Committee to not even miss any races…including an Injury Prevention and Nutrition Workshop (with another Workshop pending); expert guidance and personal input from the fabulous official Belfast City Marathon Coach Stuart Kennedy; superb OG coach training and structured planning and advice; the 1st steps towards planning the Neal Killen Shield and; …(drum roll…) the announcement of the 2019 Orangegrove Club Championship Fixtures! A big thanks from the club members to all the work that has already been put in…its gonna be a great year! No, its not a spelling mistake, it is either an acronym to represent arriving at the last second on the start line without having linked your watch to the satellite: Flippin Eck Alright Ready?…Run! or…it means…Forget Everything And Run Races. Our very own Jenny Powell prepared for this race on Wednesday at 7pm by eating carrots for a week but also luckily brought the compulsory head torch for the Forget Everything And Run Races NI 10k FEARR The Night Run at Clandeboye Estate Courtyard. 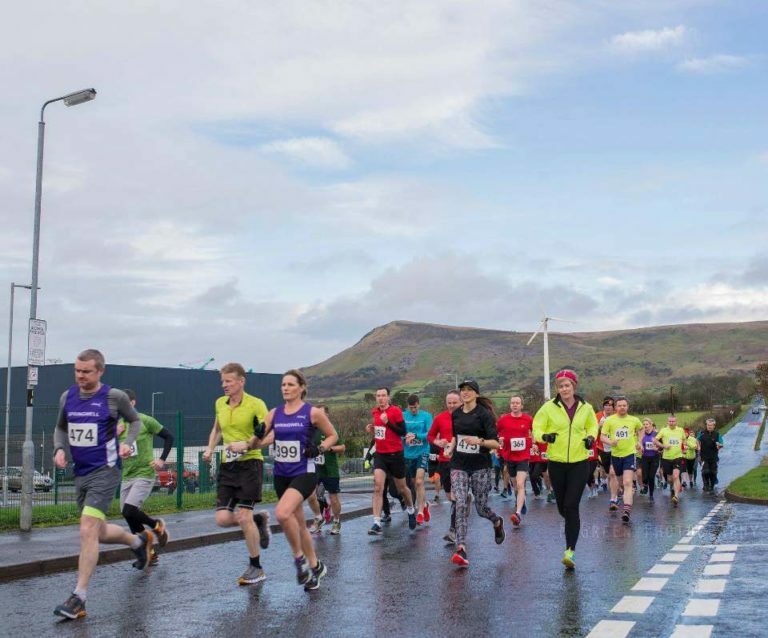 This is the 2nd in this year’s series and appears an attractive proposition running through such a lovely location whilst relying on some under-used senses plus…there were post-race hotdogs on offer and a bling of all bling medal which glows in the dark! Now that does sound illuminating. Jenny also lit up the night with a shining 85th position out of 143 in what must have been a challenging race at times. Jonathon Gibson and Kerry Speers (North Down) won the race in 40:29 and 42:05. I am usually quite good at organising my race entries in advance and in good time. However, recently I was completely confounded by the organisers of the Intermediate and Masters’ Cross Country who inexplicably closed online entries on 15th January, eleven days before the race! Why? Worse still, ‘strictly no entries on the day’! I had hoped to run in all the local cross country races this season, but it was not to be! You would have thought they should be encouraging participation rather than making it difficult! 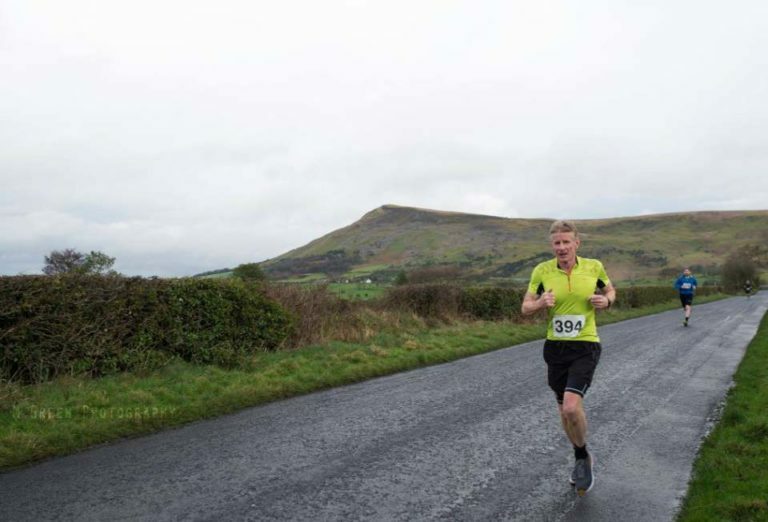 Anyway, rather than sit at home and sulk I jumped on a Derry bound Goldliner and alighted at Dungiven for the local St. Patrick’s College 10k race…and what a good decision this turned out to be. The rain that dogged Belfast had already passed through Dungiven and it was both sunny and dry. It was very distinctly a course of two halves! The first 5k through the town environs was flat, smooth and fast. Then it turned a little nasty with a trip north into the foothills of the Sperrins. As proof, minutes per mile in my case ranged from 6.32 to 7.55! Nevertheless, the scenery was stunning and there was very distinctly a feeling of Spring in the air, but not quite. The second half ups and ups and ups ensured that despite the ground made in the first half this was not to be a personal best course regardless of the downhill finish. Numbers were small and there were not too many club running vests about, bar a few Springwell. So, rather than wear my orange vest I ran incognito in green. For £10 we got chip timing, an officially measured course, superb marshals and signage, a traffic plan with PSNI presence at critical points, a medal, soup and wheaten bread, tea/coffee and biscuits, a great welcome and a goodie bag to take home. You know, some of those other organisers we come across would appear to be taking the mickey! A thoroughly enjoyable day given that I was not able to run at Barnett Demesne. I think I might return to Dungiven in 2020……if I am still alive! The 10k was won by Ciaran Ferris and Stephanie McKillop in 36:05 and 44:58. With January known for being being miserable and tight on generosity, there weren’t too many PBs or landmarks to comment on, however, well done to Jessica Skillen who achieved a PB of 30:23 at Stormont Parkrun and although Reg Sanlon was a 1st-timer at Carrickfergus Parkrun, he was out-trumped by Kimberley Reynold’s further-afield 1st-timer at Coldham’s Common. What should be common is a little bit of volunteering at Parkrun so please consider doing so at Victoria Parkrun 1, 2 or 3 times this year.